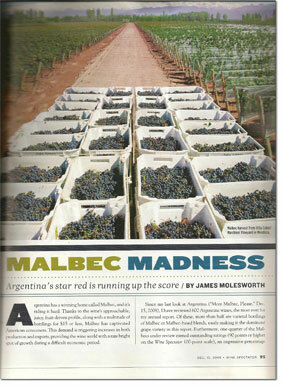 After reviewing over 600 Argentinean wines since last December – more than 50% of them Malbec or Malbec based blends – James Molesworth, Wines Spectator’s lead taster on wines of Argentina, proclaims that ‘all the foundations are in place’ for Argentina’s success in the US wine market. Unsurprisingly it is Malbec that emerges as Argentina’s leading light, with over a quarter of all Malbec based wines achieving an ‘outstanding’ rating of over 90 points and some receiving over 95 points, which Wine Spectator classes as ‘Classic: a great wine’. At the other end of the scale, speaking of value, he also rated more than 60 Malbec under $15 at 85 points or higher. Moreover, it is in these top wines that we are really starting to see the interesting nuances of Argentina’s varied terroir, with different styles emerging from Patagonia, Mendoza, Salta and also within Mendoza’s sub regions of Agrelo, Lujan de Cujo, Maipu and the Uco Valley. But what really shows Argentina’s strength in depth is that while Malbec is the star, other grapes are ‘more than just role players’. Bonarda is ‘typically a source of excellent value’, Pinot Noir manages to ‘shine in the Patagonia region’ and Torrontes produces ‘spicy whites filled with tangerine, orange and floral flavors’. So all in all another great report for 2009!